The current Chairman of Staffordshire Moorlands District Council is Councillor John Jones. A lifetime resident of the moorlands; the son of a Jack, a coalman, and Jean, John was born and bred in Biddulph, and for the last 38 years has lived, with his wife, of almost forty years, Anne, in Biddulph Moor where, in 1983, he built his own house. He has one son, Tom, a physics masters undergraduate. Now semi retired, John still works part time as a front line emergency Paramedic, a job he loves and which he came to quite late in life in 2008 after a previous retirement from a thirty eight year career as a senior projects manager in the IT industry. Elected, as the member for Biddulph Moor, to Staffordshire Moorlands District Council in 2003 John has served on the Health Overview and Scrutiny Panel at Leek for many years and is still the current Vice Chairman of that committee. 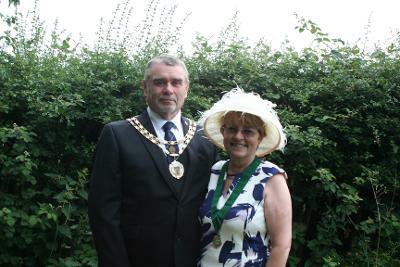 Also a parish councillor he was elected Mayor of Biddulph in 2009. When work, community and family commitments allow, John enjoys walking, travelling the world, vintage cars, antique clocks and driving his "toy" an old Porsche. He also trained for his Private Pilot's Licence, flying solo in 1996, and sings in a Rock & Roll Band!